Guns, though often synonymous with violence and destruction, are also symbolic of machismo, adventure and security. Tattoo artists across the globe have showcased their perception of these lethal weapons through tattoo art, transforming the way these objects are generally perceived. 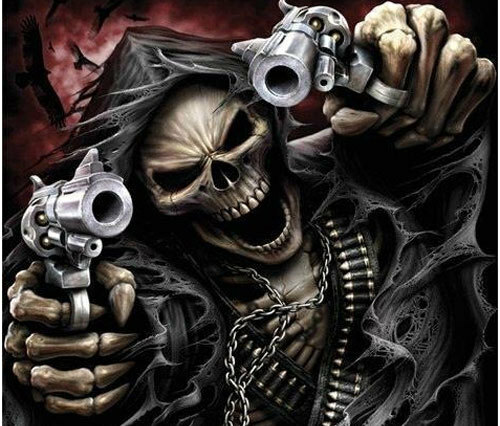 These top ten gun tattoos are aesthetic artistic depictions of guns through varied instances of tattoo art. These are often macabre, quirky and unique, but in most cases, even shockingly beautiful. This cowboy inspired tattoo is the perfect find for the strong independent girl. This piece of art is a brilliant example of a contemporary tattoo design. See how the gun sticks out from the waistline of these denim shorts. This tattoo is the epitome of trendy tattoo art. This tattoo definitely scores brownie points for innovative conceptualization. Each finger is used to form a complete rifle. Not exactly a big elaborate piece of art, this tattoo is subtle yet trendy. 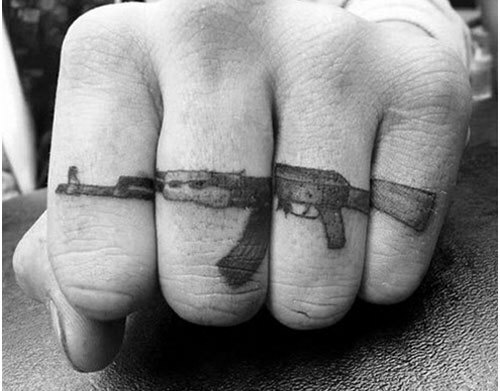 Traditionally, gun tattoos are geared towards the male clients. 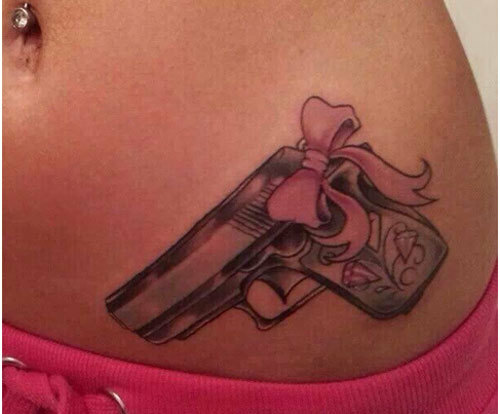 However, this gun tattoo, with a pink bow, is symbolic of girl power. Have this inscribed on your skin to flaunt your feminine charms that definitely can’t be mistaken for weakness. This tattoo is the perfect abstract representation of feminine strength. Bubblegum pink and neon blue, this gun tattoo has it all. It’s absolutely amazing how this tattoo artist uses a shocking palette of colors to create a piece of art that is unique, and at the same time, quirky. 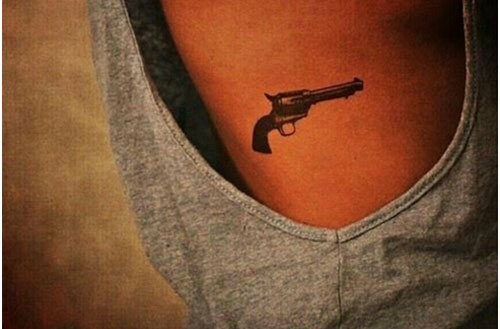 This gun tattoo is sure to grab attention wherever you go. Macabre and elaborate, this tattoo has the perfect ingredients that make up a unique tattoo. Though this may be a bit too violent for some, it does not fall short of pure brilliance and genius. If you are looking for a gun tattoo that is subtle yet attractive, this miniature gun tattoo is the perfect find for you. Have an experienced tattoo artist replicate this on your skin. 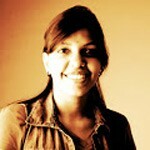 It’s best to stick to the concept as depicted here to get the best result. 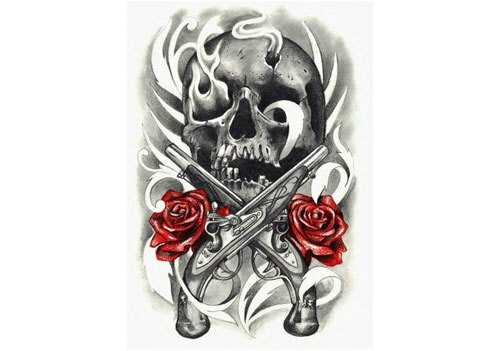 This tattoo has all the clichés of tattoo art, namely skulls, guns and roses, juxtaposed together to form a unique piece of art. See how the scarlet red roses clash with the mostly grey guns and skull for a stunning contrast of colors. Aesthetic and elaborate, this tattoo is a definite attention grabber. 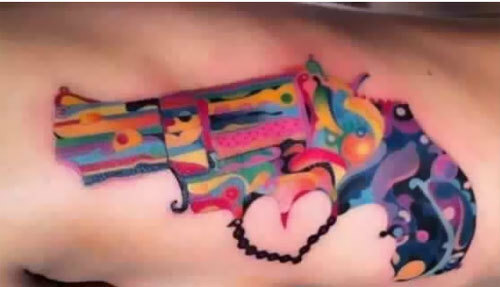 Yet another gun tattoo with an apparent feminine theme. This piece of art is composed of flowers that form a gun. 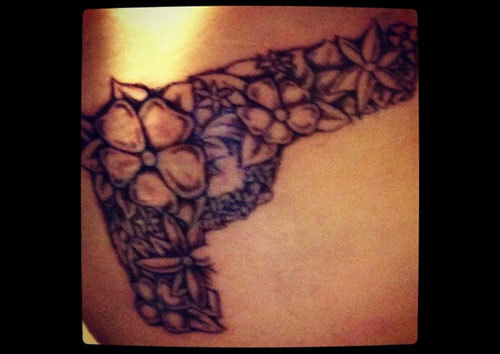 An apt display of strength and feminism, this floral gun tattoo effectively promotes girl power. For those with an affinity to tribal art, this gun tattoo is the perfect find. 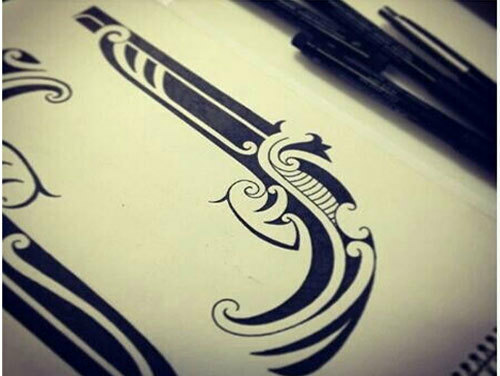 Intricate and astounding, this tribal art inspired gun tattoo is high on aesthetic value. A single shade of darkest black highlights this piece of art. 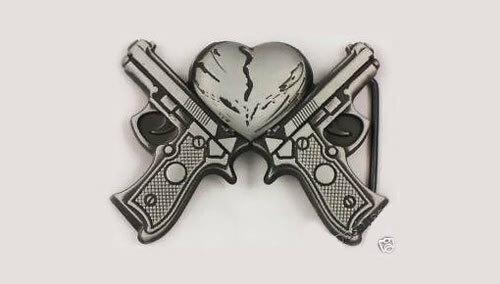 Broken heart tattoos are quite cliché, but when you pair them up with guns, as depicted here you get a unique and trendy tattoo. This tattoo is sure to get you the attention and admiration of friends and peers. 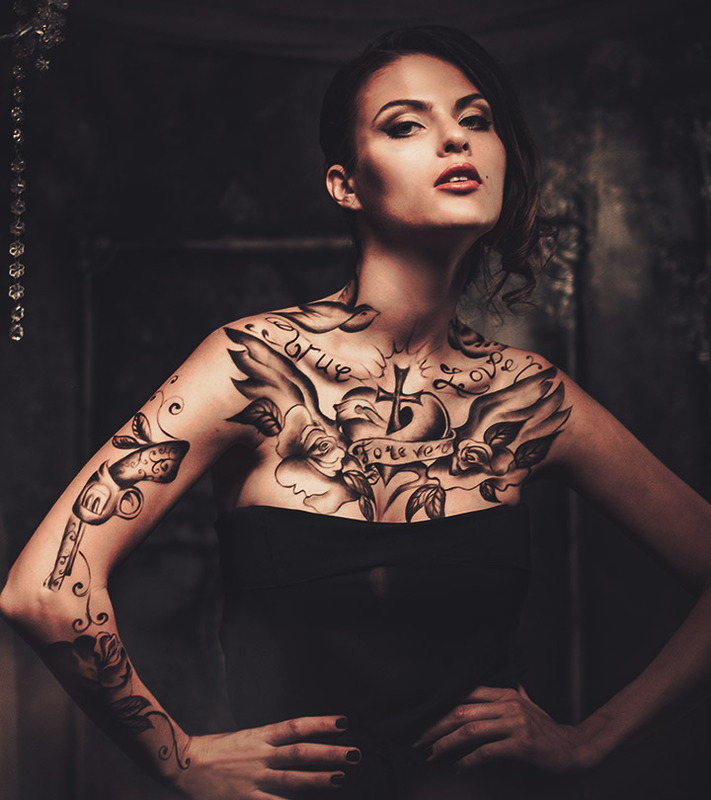 With tattoos becoming extremely common these days, sporting one of these ‘different’, elegant and artistic tattoos are sure to grab you some eyeballs and compliments.